The input-output characteristic of a TTL inverter shows the variation of its output voltage Vo with respect to the variations in its input voltage Vi. Figure 3.7 shows an experimental setup for plotting the characteristics of a two-input 7400 NAND gate IC whose input terminals are shorted together to form an inverter (NOT) gate. For plotting the inverter characteristic, we vary the input voltage from 0 V to +5 V in steps of 0.1 V and note the corresponding values of output voltage. Figure 3.8(a) shows the ideal characteristic of an inverter. In Fig. 3.8(a), we find that when Vi = 0 V, Vo = +5 V and when Vi = +5 V, Vo = 0 V. This means that, ideally, the transition from 0-to-1, and 1-to-0 should occur in zero time. 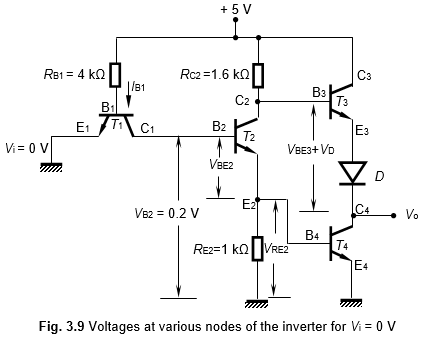 Thus we expect an ideal inverter characteristic to have sharp vertical edges, as shown in Fig. 3.8(a). 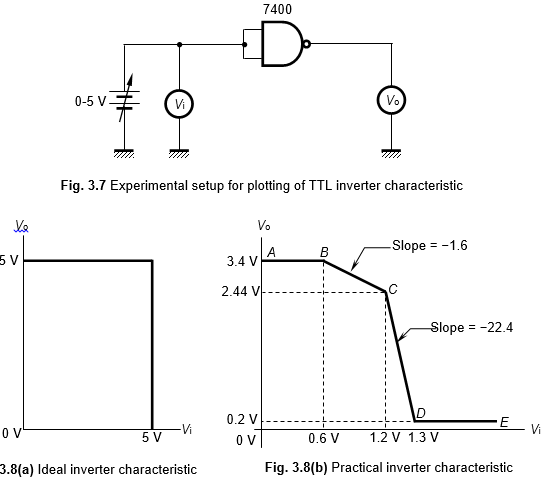 However, the practical inverter characteristic shown in Fig. 3.8(b) can be seen to differ greatly from the ideal characteristic. = voltage drop across the 1-kΩ emitter resistor of T2, as shown in Fig. 3.10. Also, let VBE2 = 0.5 V, and VRE2 = 0.3 V. When VBE2 = 0.5 V (cut-in voltage), T2 enters into its conduction mode and begins to act as an amplifier. Since RE2 is not bypassed, T2 will act as a current-series feed back amplifier having a negative voltage gain of AV2 = ‒RC2/RE2 = ‒1.6 kΩ/1 kΩ = ‒1.6. This is indicated as point C in Fig. 3.8(b). We also notice that, since VRE2 = 0.6 V, VBE4 = 0.6 V and this makes T4 to start conducting. Now, if the input voltage is increased from 1.2 V to, say, 1.3 V, we find that VRE2 becomes greater than 0.6 V and T4 enters into saturation. With T4 in the conducting state, we have its output voltage Vo = Z = 0.2 V. This drop in output voltage Vo from 2.4 V (corresponding to Vi = 1.2 V) to 0.2 V, (corresponding to Vi = 1.3 V) is very sharp, and has a slope ≈ ‒(2.44 – 0.2)/0.1 = 22.4. This is indicated by the line segment CD in Fig. 3.8(b). 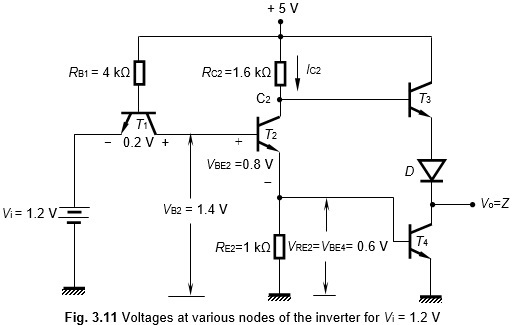 We observe that, if the input is increased from 1.3 V to +5 V (the maximum permissible value of VCC for TTL gates), the output voltage is found to remain constant at 0.2 V, which ensures that the TTL inverter output is at logic 0. This is indicated by segment DE in Fig. 3.8(b). 1. VIL: This is the voltage recognized by a TTL gate at its input to keep its output at logic 1, (i.e., transistor T4 is in the OFF-state). Typically, VIL ranges from 0 to 0.8 volt. 2. VIH: This is the input voltage required to produce a change in the output from logic 1 to logic 0. VIH lies between 2 and 5 volts. 3. 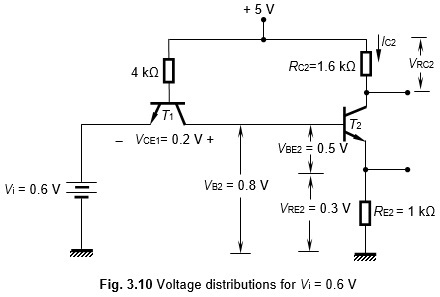 VOL: This is the output voltage of a TTL gate recognized as logic 0 (i.e., T4 in the ON-state). VOL lies between 0.1 and 0.4 volt. 4. VOH: This is the output voltage of the TTL gate recognized as logic 1. VOH varies between 2.4 and 3.6 volts.